British poet William Cowper penned the quote "Variety's the very spice of life, that gives it all its flavor." This certainly applies to the canvases of nationally acclaimed artist Francis Livingston. 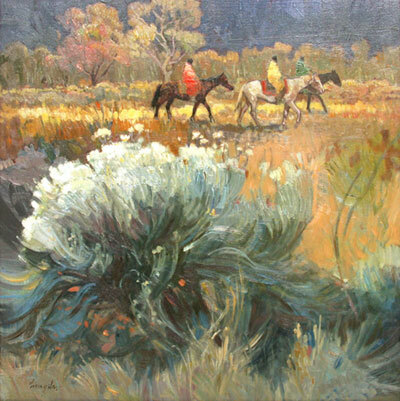 Ranked as one of the top American illustrators, Livingston paints a variety of subject matter and has found a niche for his Western scenes and Southwest landscapes. "I paint a variety of subject matter so when I paint my Southwest scenes it becomes a very special time of creativity for me because I'm not doing it all the time," says Livingston. "The work for me never becomes stale or boring because I treat it and it feels like a new venture each time." Medicine Man Gallery in Santa Fe, New Mexico, will present Livingston's new northern New Mexico and Southwest-themed oil paintings in a solo show that runs July 2 through August 1. The artist will attend the opening reception on July 2 from 5 to 7 p.m. 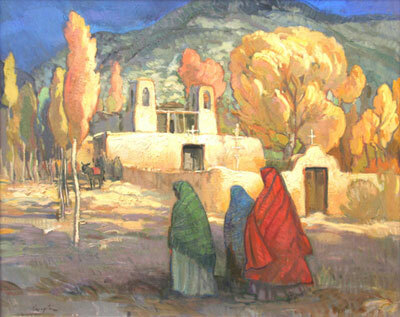 This is the only gallery that features the artist's Southwest work. "I've been interested for some time now in portraying the more romantic and beautiful historic side of pueblo life, Santa Fe and Taos. 'This show continues those ideas," Livingston says from his home in Idaho. In this grouping, Livingston focuses on flat shapes or patterns of color that play against more rendered areas, hence the show's title, Patterns in Paint. "The paint texture remains thick and is probably getting thicker overall as the paint itself becomes as important as the subjects being painted," he says. Two pieces that best illustrate Livingston's idea of patterns in paint are Violet Mountain Valley and In Deep Forest. "Both of these paintings work with flatter shapes and push the graphic quality that I'm aiming for in this body of work," he says. Collectors of Livingston's work also will notice more changes in weather. Additionally, the artist spotlights area in the paintings that are saturated in sunlight, evoking a feeling of variety in terms of mood within the paintings. Ideal examples of this direction are found in Storm Watcher and The Emerging Light. "I always like variety so if I can vary the locations and deal with the panoramic views as well as closer and tighter compositions then I can maintain my interest in the show as a whole," says Livingston. Storm Watcher, a rarity for Livingston, deals with total shapes. The red figure is added for scale and balance. "I really wanted the mood to that piece. I didn't want to go crazy with the color so I was trying to pull back in terms of where I used brighter color and create this massive structure in a landscape," he says. "It was a fun piece and one of my favorites." 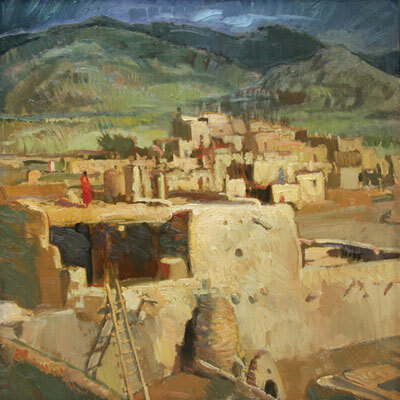 Consistent with his past works, these pieces pay homage to pueblo architecture and the region's historical assets. "I've tried to keep them somewhat timeless so the emphasis is placed on the mood, color and paint quality and less on exactly where and when a particular scene took place," explains Livingston. In this body of work he continues the theme of a solitary figure or small group on horseback surrounded by aspens or rivers, but lately the figures are most prominent and the landscape secondary. "I'm even incorporating more aspens and rivers and changing the scale of aspen leaves and placing the figure so it's within the middle ground. The leaves, trunks, bushes...everything is rendered but I'm thinking more in shapes next to each other," he adds. 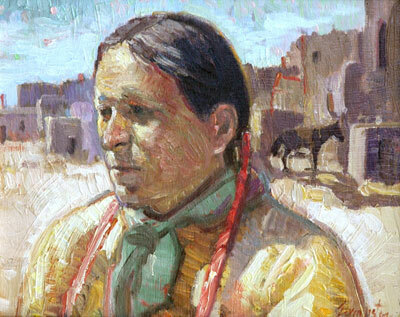 Livingston's deep understanding of history, the land and its people allow him to create imagery reminiscent of the Taos Founders and other great Western artists like Maynard Dixon and Ernest Blumenschein. "To paint modern-day imagery, for me, feels more like my illustration work. I need a timeless historical bent to it because I feel like I'm creating the imagery that could have been around at a certain time," says Livingston. "I feel like I'm being creative with a piece as opposed to saying here's some photographs and I'm copying them."